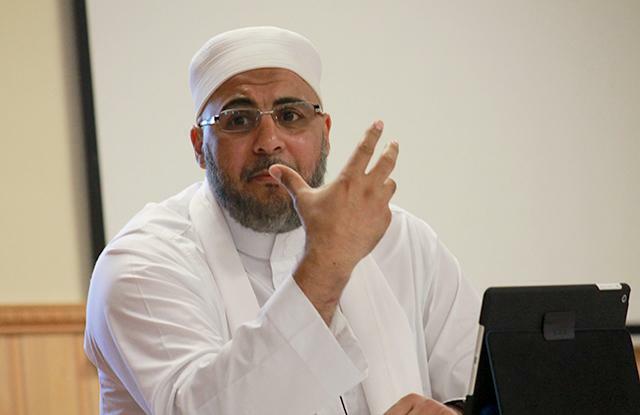 (MinnPost photos by Ibrahim Hirsi) Sheikh Jamel Ben Ameur, imam of Masjid Al-Tawba Islamic Cultural Community Center in Eden Prairie, discusses caliphate state and the raging violence in Iraq and Syria. Ben Ameur has called on his Muslim counterparts to be careful about their comments regarding the group amid developing revelations that several Twin Cities Muslims have been recruited to join the Islamic State, which is also often referred to as ISIS or ISIL. In the most recent instance, two Minnesota men — Abdullahi Yusuf, 18, and Abdi Nur, 20 — were charged this week with conspiring to support the terrorist organization. Community Sketchbook focuses on the economic and social challenges facing communities, especially low-income communities and communities of color, and how people are trying to address them. It is made possible by sponsorship support from The Minneapolis Foundation. Community Sketchbook articles may be republished or distributed, in print or online, with credit to MinnPost and the foundation. In June, the Islamic State declared an Islamic caliphate, and designated Abu Bakr Al-Baghdadi as the caliph and “leader of Muslims everywhere.” Since then, ISIS has remained under a global microscope that has magnified its violent actions, which have including crucifixions and beheadings, most notably of American journalists James Foley and Steven Sotloff. Ben Ameur was speaking about the dozens of Minnesota Muslims who have slipped away since 2008 to join Al-Shabab in Africa and the Islamic State in the Middle East. The most recent suspected wave believed to join the Islamic State includes Abdirahmaan Muhumed, 29-year-old father of nine, who reportedly died in August fighting for the Islamic State in Syria. Douglas McAuthur McCain, 33-year-old African-American, who attended high school in Robbinsdale, also died for ISIS around the same time and in the same battle as Muhumed. A crowd of about 100 Minnesota Muslims attended a presentation earlier this year about the caliphate state through Islamic prospective at Masjid Al-Tawba Islamic Cultural Community Center in Eden Prairie. Federal officials have estimated about 100 Americans have left the country to join terrorist groups in Syria, with about six to 12 residents of the Twin Cities, according to Special Agent Gregory Boosalis, a spokesman for the FBI’s Minneapolis office. Without condemning a particular group, Ben Ameur described the Iraqi and Syria situation as meaningless violence. He urged young Muslims to be careful about the choices they make in life. “Don’t let your emotions guide you,” he said. Influential and armed Islamic organizations fighting to establish Sharia law have always existed in many parts of the Islamic world. And while the Islamic State has a lot in common with these organizations, two things make ISIS stand out: The declaration of a “caliphate” — or an Islamic state — and the appointment of a ‘caliph,’ a supreme religious and political leader for Muslims throughout the world. The establishment of an authentic Islamic state is complex and requires representation of all Muslims, Ben Ameur said, and the creation of previous caliphate systems was more than just a group of people coming together and announcing Islamic states and leaders. Islamic states after the death of Prophet Mohammed were named by Ahlul Halli Wal ‘Aqd — people of influence and authority — a group of people with respect and integrity among Muslims who were charged with making important decisions. Minneapolis Mayor Jacob Frey is implementing policy which requires all Minneapolis Police Department squad cars to carry newly made placards which inform potential immigrant detainees of their rights. The cards are written in English and Spanish and note one’s rights not to inform police of their birth country, immigration status or citizenship status.